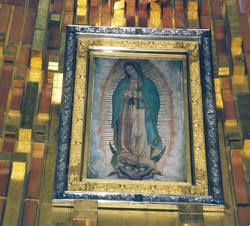 Years ago I went on a business trip to South/Central America with the agreement that when we were in Mexico City I got time out to visit the Basilica of Our Lady of Guadalupe. On her feast day today I pulled out the photos from my trip there (pre-digital) to relive the great memories. I had a very kind cab driver not only take me to the Basilica but he attended Mass with me, got me into the museum and up the hill to the old chapel. I’ll never forget it. 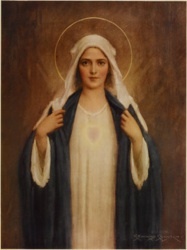 She is the Patroness of the Americas and of my heart. The latest in an ongoing series from Opus Dei about the life of Mary was just published on their website. The fifth reflection on our Lady’s life during this Marian Year in Opus Dei. This month we consider the Archangel Gabriel’s Annunciation to Mary, and Christ’s entry into the world. This month we celebrate the 80th anniversary of the moment when St. Josemaría saw that Opus Dei was also intended for women. We know that on October 2, 1928, when he received the foundational light, our Father thought that the Work was only for men. Thus we can imagine his surprise and joy when a few months later, on February 14, 1930, our Lord made him understand that he was also counting on women to carry everywhere—through their example and word—the message of sanctification in professional work and in all the circumstances of ordinary life. Years later, with deep gratitude to divine Providence, he said that “truly the Work, without that express wish of our Lord and without your sisters, would have been left crippled.” He often made reference to this, my daughters, to show what a great responsibility each one of you has. Although it’s a small digression, I ask you to commend to heaven an intention that will make you very happy. As in 2008, when we commemorated the 80th anniversary of the foundation of the Work, it has seemed to me that the best way to channel our thanksgiving is to stay very close to our Lady during these months. Therefore it gives me great joy to convoke a new Marian year in Opus Dei, from the upcoming 14th of February to the same date in 2011. During these months, let us strive to honor our Mother more and better, above all by putting great care into the prayer and contemplation of the Holy Rosary, and spreading this devotion among our families and friends. And let us give express thanks to God for the work of the women who look after the material care of the centers of the Prelature, which contributes so decisively to maintaining and improving the environment of a home that God infused into the Work, when he inspired it in our Father in 1928. Something I never expected to find on my first visit to the Pacific Northwest was a beautiful grotto dedicated to the Blessed Mother. This beautiful 62 acre Catholic Shrine and botanical garden was established in 1924 and is administered by the Order of Friar Servants of Mary. 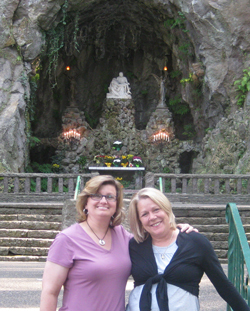 The central attraction, Our Lady’s Grotto, was carved from solid basalt in the cliff wall in 1925. Above its natural rock altar is the white marble replica of Michelangelo’s famed masterpiece, the Pieta. High above the grotto’s cliff stands the bronze statue of Our Sorrowful Mother, designed especially for the Sanctuary and blessed in the Vatican by Pope Pius XI in 1934 to commemorate the 700th anniversary of the Servite Order. 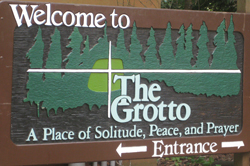 There is much more to the Grotto and to see it all requires an elevator ride up to the top of the cliff (for a nominal fee) and we spent about four hours on a lovely day exploring the grounds. I highly recommend a visit if you are ever in Portland. Post update: Here is a video on YouTube that I put together with photos from our visit. August 15 Total Consecration Prep Starts Today! For those who wish to make/renew their Total Consecration to Jesus through Mary on a Marian feast day, the next one coming up is the feast of the Assumption on August 15, which means the 33-day preparation begins today! This is the date of my own first Total Consecration (11 years ago) and when I try to renew it every year. 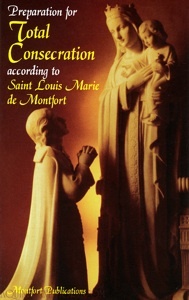 Total Consecration to Our Lady is, as St. Louis de Montfort says in his book True Devotion to the Blessed Virgin, the “easy, short, perfect and secure way of attaining union with our Lord.” This is the devotion consists in making oneself a slave of Mary, doing all our actions by Mary, with Mary, in Mary and for Mary. We offer to the Blessed Mother every thought, word, deed and desire so that she might purify them and present them to our Lord to be distributed where they are most needed. It is a total abandonment to the Blessed Virgin Mary who will in turn lead us into a perfect union with Christ, her Son. If you don’t have the Preparation for Total Consecration book, this website offers a very thorough explanation of how to proceed. It includes links to all readings and prayers for every day so that ordering books is not necessary. Paul, at Alive and Young, also has a great “Word Made Fresh” satire of Mr. T on Mary and the Rosary.